Rumors have been heating up in the past couple of weeks about Darth Vader appearing in Rogue One: A Star Wars Story, slated for a December 16th release. Now our friends at MakingStarWars.net have a description of some proposed action scenes for Vader in the Gareth Edwards directed film. As usual, there is a chance this may not be accurate but if you are trying to avoid all Rogue One spoilers stop reading now. This is you SPOILER ALERT! "The action sequences filmed are unknown, but there was work pitching the different ways Darth Vader could kill rebels on a battlefield with the Force and his lightsaber. 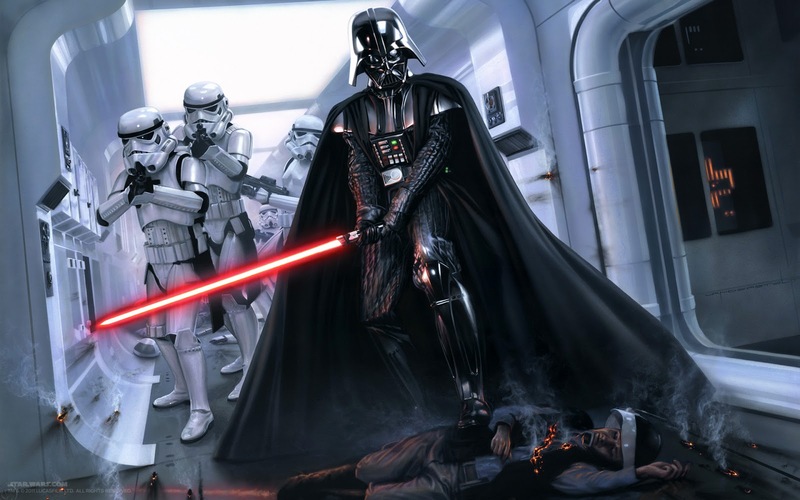 The storyboard “pitches” showing decapitated rebels, people being dismembered by Vader throwing his sword, levitating bodies to make human shields and so on. The art was more violent than what we’ve seen Darth Vader do on screen before. I wish there were more details on the setting of the ground battle but the most we could get was that it was a smokey battlefield." For what it's worth I'd heard that the script as originally constituted for Rogue One was pushing an R rating. Based on what we know about the film, it's believable that the story could be suited to an R rated war film, however I have a hard time believing Lucasfilm and Disney would want to do an R rated film so early into this new era of Star Wars. I would expect the film would get a PG-13 rating (like The Force Awakens), but that's just speculation on my part. On one hand, Vader is one of my favorite characters, and a classic big-screen villain, so I'm excited by the prospect of seeing him in theaters again, but I think ultimately I'd rather he not be involved...I mean, it's kind of like what Dave Filoni said about putting him in Rebels, how many times can you show him fail and maintain his stature? One things for sure - this absolutely will not be an R rated film, Disney relies on the 12 and under age target demographic for its dollar return. It comes down to marketability - As much as I'd really like to see Vader kicking @$$ on a battlefield it won't be anywhere near as visceral as you'd want. To watch VADER on he's prime, crushing rebels.... its just a WETDREAM.